Kampot has changed a lot in recent years. 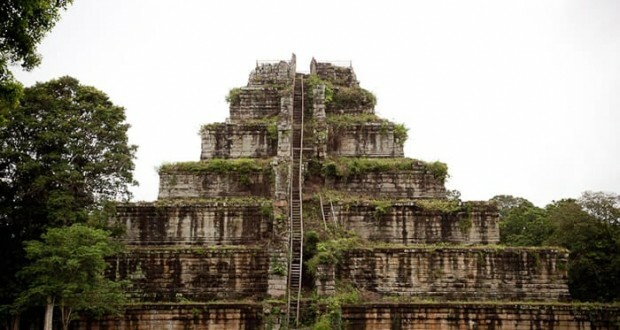 Once the last a stronghold of the Khmer Rouge, it was a city heavily ruined and largely evacuated of it’s residents. Thankfully since then tourism is steadily increasing and with that, new hotels, guest houses and bungalows too. 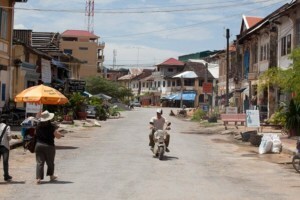 There is also one hotel I would definitely consider a boutique hotel in this peaceful Cambodian town. Currently La java Bleue Hotel has just 3 rooms with 2 more being built across the road. What this does mean is an amazing attention to detail on every aspect of each room. 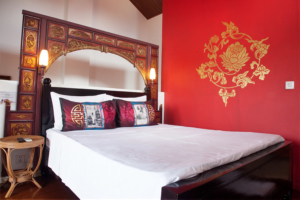 The 3 current rooms are individually styled, in Colonial French, Khmer and Chinese interior. All to an impeccable standard I’m pretty sure you wont find anywhere else in Kampot. We chose to stay the night in the French room which boasts a large bed perfect for a married couple! Adorned with prints of French holiday posters and a wall filled with windows, all with shutters as well, it’s a wonderfully styled environment that invites you to relax and enjoy your surroundings. There’s also a sofa, coffee table and modern styled bathroom. We were greeted by the friendly staff at La Java Bleue who kindly took our bags to our room and gave us a tour of the hotel. They were very helpful and enjoyed exercising their English, even asking us to help them with a few confusing words. We were more than happy to oblige and it made for a nice personal experience. While our stay was short we felt at home thanks to the staff and the beautiful room. They always greeted us with a smile and a fun chat. Our tour of the hotel gave us a chance to check out the interior design of the other rooms, the Khmer and Chinese styled. Again they didn’t disappoint, with gorgeous bathrooms and all the modern accessories you’d expect from a boutique hotel. The Khmer room features 2 single beds although they were both practically doubles in width. There are some very interesting photos of local Khmer people during the French colonial period, beautifully framed on one wall. This corner room boasts so many windows you get a great view of the cross roads outside and the gentle hustle and bustle of town filled with more people on mopeds, tuk tuks and bicycles than cars. The Chinese room features a large double bed in a smaller room but with the added bonus of a private balcony. 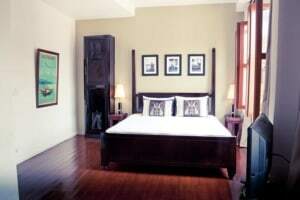 The large folding metal and glass doors of the balcony are wonderfully designed and lead out to views over the roof tops of nearby buildings and out towards the Bokor National Park. In the day time it can be pretty hot out there but in the evenings it’s a great place to relax after a shower and watch the sun set. 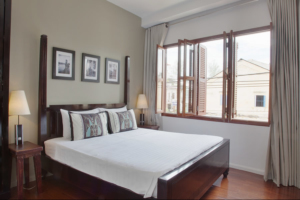 The bed, as with the other rooms, includes bespoke pillows with images befitting the style of the room. I particularly liked the pillows in the Chinese room and the red lanterns hanging above the bed. 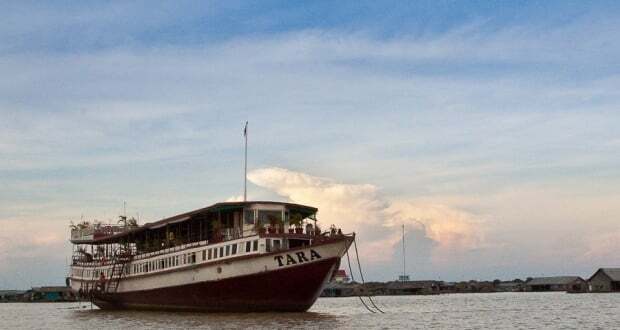 As the tourism increasing in Cambodia so do the number of hotels, hostels, bungalows and boutiques. It’s definitely a growing market and Kampot is such a new place to visit. This often leads to a lot of hotels copying the trends from their competitors. It’s great to see a hotel doing something different to the competition at La Java Bleue. It’s also great to see such an immaculately designed and maintained hotel, something you only usually find in the world’s best luxury hotels. At just $45 in the dry season and $35 during the wet, it’s a slice of boutique living that’s easily affordable. Well worth it for the beautiful surroundings and the friendly staff. 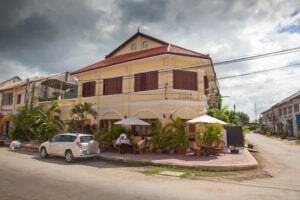 Check out our short video from our stay at La Java Bleue, Kampot. 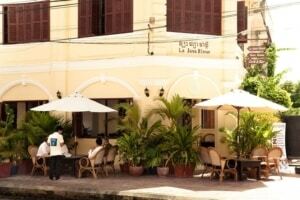 A big thank you to La Java Bleue in Kampot for their hospitality and the opportunity to review their hotel.